What are GnuComm and GNU Telephony? What is GNU SIP Witch? GnuComm is the Telecom subsystem of the GNU Project. The goal of GnuComm is to deliver scalable telephony services for current and next generation telephone networks using entirely free software on the GNU system. GnuComm currently includes 7 GNU projects: Bayonne, SIP Witch, and their supporting libraries (Common C++ / uCommon, ccAudio, ccScript, ccRTP, and ZRTP / ZRTP4J). The menu provides quick access to the web pages of the corresponding packages, and to download information for stable releases and additional recommended files. Since 2006, these components have been developed through GNU Telephony. 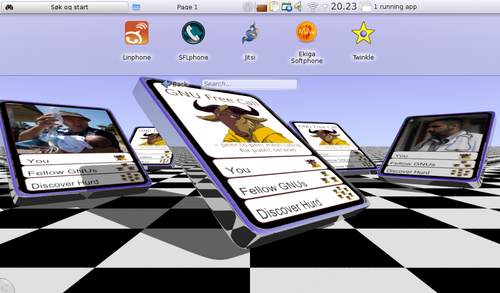 GNU Telephony is a project to enable anyone to use free (as in freedom) software for telephony, and with the freedom to do so on any platform they choose to use. We also wish to make it easy to use the Internet for real-time voice and video communication, and in fact for all forms of real-time collaboration. Finally we wish to make it possible to communicate securely and in complete privacy by applying distributed cryptographic solutions. Our goal is to enable secure and private real-time communication worldwide over the Internet that is free as in freedom, and is also free as in no cost too! GNU Bayonne is the telephone server of the GNU Project. It offers scalable media and scripted voice application services for SIP and H.323 networks as well as for traditional PSTN and ISDN services. GNU Bayonne may be used standalone to deliver carrier-hosted or premise application services behind existing switching equipment and standard compliant VOIP platforms, or together with GNU SIP Witch to offer complete VOIP phone systems. The following documents reflect the main periods of GnuComm / GNU Telephony development. Many of them were retrieved from wiki.gnutelephony.org and www.gnutelephony.org (archived). You will also find a wealth of information on the Events & Articles page, notably historical overviews in David Sugar's slide presentations at the ClueCon 2005 (Bayonne), and the LibrePlanet 2012 (GNU Telephony). bug-gnucomm is the developers list: <bug-gnucomm@gnu.org>. Subscribe to this list by sending the word “subscribe” in the body of an otherwise empty message to <bug-gnucomm-request@gnu.org>. help-gnucomm is the users list: <help-gnucomm@gnu.org>. Subscribe to this list by sending the word “subscribe” in the body of an otherwise empty message to <help-gnucomm-request@gnu.org>. info-gnucomm is the moderated announcements list: <info-gnucomm@gnu.org>. Subscribe to this list by sending the word “subscribe” in the body of an otherwise empty message to <info-gnucomm-request@gnu.org>. The current coordinators for the project are <richbodo at gmail dot com> and <dyfet at gnu dot org>. Please send general FSF & GNU inquiries to <gnu@gnu.org>. There are also other ways to contact the FSF. Broken links and other corrections or suggestions can be sent to <bug-gnucomm@gnu.org>.